'Holy Night' (Ken Mohr, R. 1983). Seedling# 6-34-1. TB, 35" (89 cm), Early bloom. 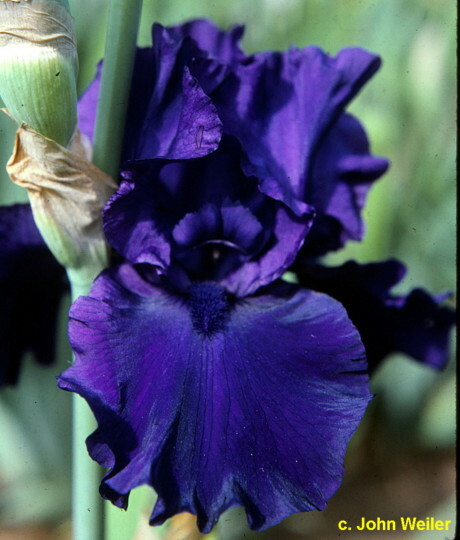 Ruffled and velvety deep violet purple (RHS 83A); deep purple beard. 'Dusky Dancer' X 'Royal Ballet'. Mohr Gardens 1983. JPG HolyNightSI.JPG manage 191 K 16 Apr 2019 - 15:54 Main.TLaurin Photo by Sandy Ives.